Mount Spurr volcano is an ice- and snow-covered stratovolcano complex located in the north-central Cook Inlet region about 100 kilometers west of Anchorage, Alaska. Mount Spurr volcano consists of a breached stratovolcano, a lava dome at the summit of Mount Spurr, and Crater Peak vent, a small stratocone on the south flank of Mount Spurr volcano. Historical eruptions of Crater Peak occurred in 1953 and 1992. These eruptions were relatively small but explosive, and they dispersed volcanic ash over areas of interior, south-central, and southeastern Alaska. Individual ash clouds produced by the 1992 eruption drifted east, north, and south. Within a few days of the eruption, the south-moving ash cloud was detected over the North Atlantic. Pyroclastic flows that descended the south flank of Crater Peak during both historical eruptions initiated volcanic-debris flows or lahars that formed temporary debris dams across the Chakachatna River, the principal drainage south of Crater Peak. Prehistoric eruptions of Crater Peak and Mount Spurr generated clouds of volcanic ash, pyroclastic flows, and lahars that extended to the volcano flanks and beyond. A flank collapse on the southeast side of Mount Spurr generated a large debris avalanche that flowed about 20 kilometers beyond the volcano into the Chakachatna River valley. The debris-avalanche deposit probably formed a large, temporary debris dam across the Chakachatna River. The distribution and thickness of volcanic-ash deposits from Mount Spurr volcano in the Cook Inlet region indicate that volcanic-ash clouds from most prehistoric eruptions were as voluminous as those produced by the 1953 and 1992 eruptions. 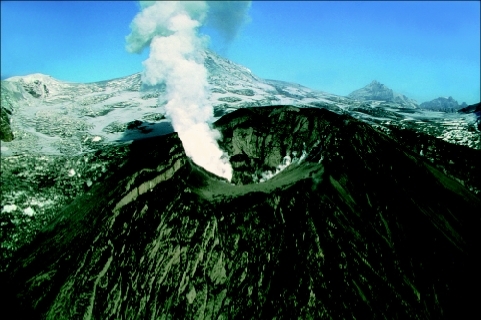 Clouds of volcanic ash emitted from the active vent, Crater Peak, would be a major hazard to all aircraft using Ted Stevens Anchorage International Airport and other local airports and, depending on wind direction, could drift a considerable distance beyond the volcano. Ash fall from future eruptions could disrupt many types of economic and social activities, including oil and gas operations and shipping activities in the Cook Inlet area. Eruptions of Crater Peak could involve significant amounts of ice and snow that would lead to the formation of large lahars, formation of volcanic debris dams, and downstream flooding. The greatest hazards in order of importance are described below and shown on plate 1. Waythomas, Christopher F.; Nye, Christopher J., 2001, Preliminary Volcano-Hazard Assessment for Mount Spurr Volcano, Alaska: U.S. Geological Survey Open-File Report 01-482, 40 pp., https://pubs.usgs.gov/of/2001/0482/.